Whenever someone mentions the word "hormones" people often think of PMS or menopause. However, hormones aren't just about your uterus, ladies. It goes deeper than that. And this is why a hormonal imbalance is something every woman should be aware of. 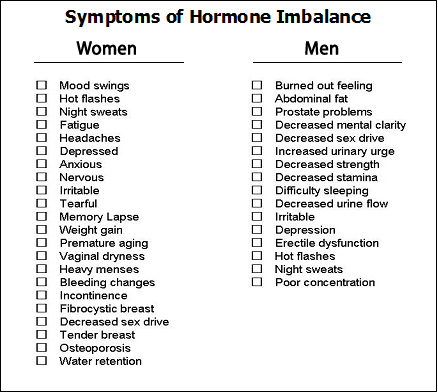 If you say that an imbalance in your hormones can only be checked by a doctor, you are wrong. There are physical signs of hormonal imbalance as well. You see, your body has the capacity to handle all problems and it tries to deal with hormonal imbalance as well. But, when it fails, it starts to send out signals to warn you--irregular period, abdominal cramps, mood swings, and so on. Here are five physical signs that can point out if you are having a hormonal imbalance. While there can be various reasons behind hair thinning, but it can also be because of irregular hormones. It all starts from head to toe, as the brain first tries to send the signals from the point that is closest to it--your hair. Unlike the common loss of hair strands, you'll find you hairline thinning and losing out hair in chunks. An imbalance in your hormones can also affect the state of you mind. If you are not an anxious person, but notice that you are feeling on the edge all of a sudden, it could be because of your hormones. You may not always be under depression, but there would be something that keeps bothering you enough to make you gloomy. This anxiety and feeling of depression are caused when your body isn't going through its natural way of dealing with hormones. Yes, dark circles are often the result of exhaustion, lack of sleep, and stress. But it could also be due to your hormones. If you have stubborn dark circles, that refuse to leave you no matter what you do, chances are that it's because of irregular hormones. We all know how the slightest things can sometimes lead to zits and pimples. Especially if you live in a metropolitan city, the pollution and dust can wreak havoc on your skin. But, in the case of hormonal imbalance, its appearance is consistent. Yes, everyone sweats. But if you are literally sweating like a pig, you may want to consult your doctors as your hormones might be going haywire. It's a natural tendency to sweat under the extremely hot weather or physical activity, but if you start sweating due to nervousness or simply fear of something and if the sweating comes along with deep foul smell, it's an indication of the hormonal issue.